Back in November Debbie shared an article with me (over at Shower of Roses) that was written by Iris Hammett in the 1940's titled "Cookie Cutters Tell the Story of Christmas." 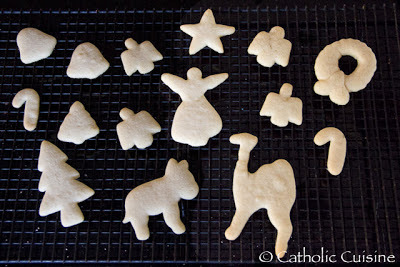 We have made Nativity Cookies and Starlight Cookies in the past, but I thought this story would be a fun alternative for this year and we finally had a chance to make them today! We also spent some time making cookies to go along with a couple more of our Christmas picture books, but I'll post about those later. 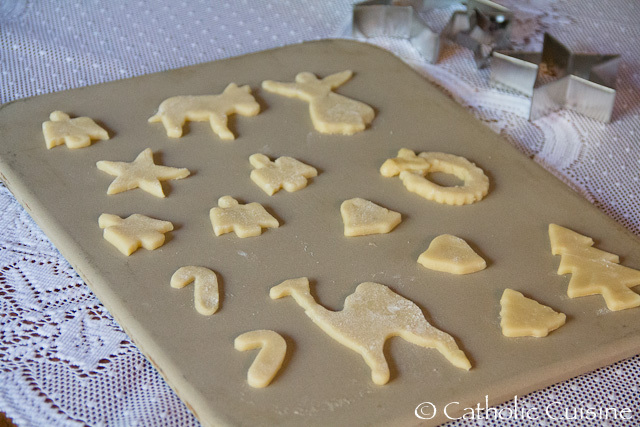 "It is a story, as suggested by cookie cutters, which are familiar to the younger generation both for their utilization purpose in shaping sweets and as playthings for toddlers. This is their message as interpreted by Mrs. Iris Hammett." "The oven is heated, the dough is made, and the kitchen table is spread with an array of cookie cutters. 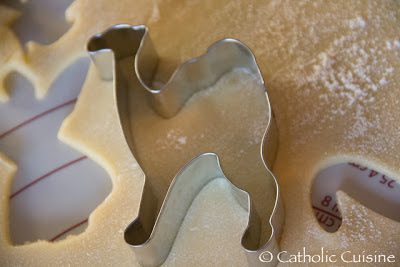 But theses are not just ordinary cookie cutters, for they have a story to tell." "Three (Seven in our case!) 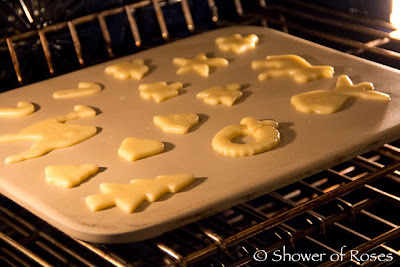 anxious little faces look on with great anticipation of receiving a sweet morsel when it is baked. 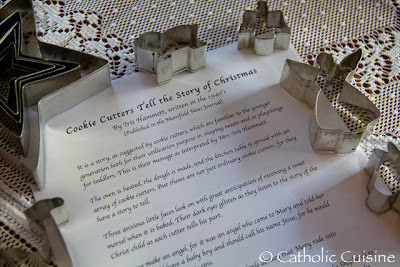 Their dark eyes glisten as they listen to the story of the Christ child as each cutter tells his part." 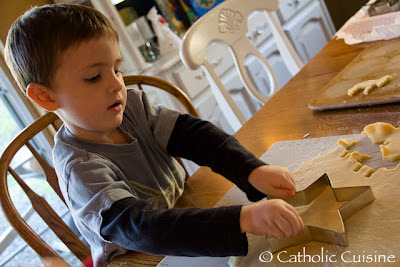 "First, we make an angel, for it was an angel who came to Mary and told her that she would have a baby boy and should call his name Jesus, for he would save his people from their sins." "Second, we make a donkey, for it was a little donkey that Mary rode into Bethlehem where the baby Jesus was to be born." 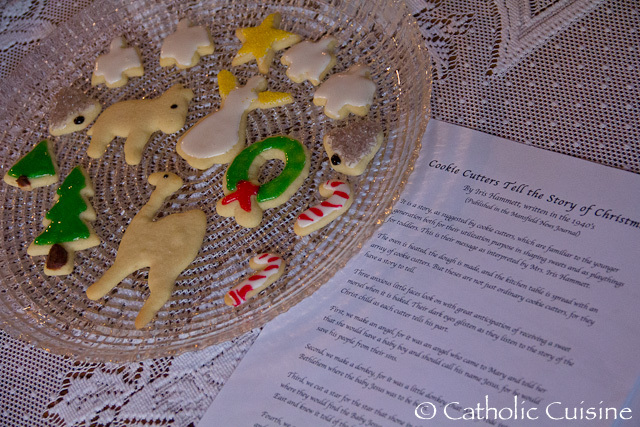 "Third, we cut a star for the star that shone in the East to guide the Shepherds to where they would find the Baby Jesus. 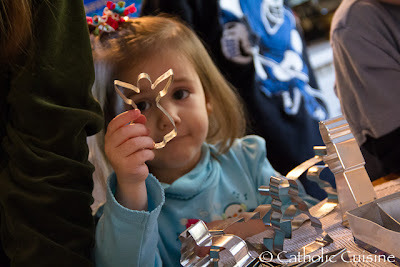 The wise men had seen this star in the East and knew it told of the birth of the Savior." "Fourth, we cut more angels for the angels who sang Glory to God in the highest, and on earth peace, good will toward men. 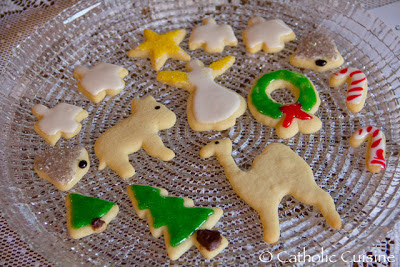 The angels also brought the good news to the shepherds as they watched their sheep during the night." 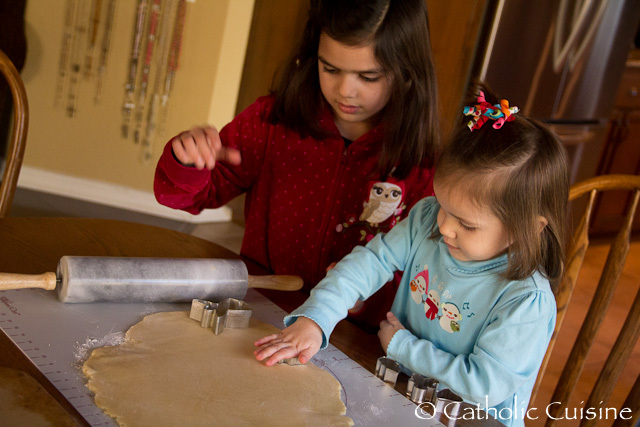 "So we make candy cane cookies to represent the shepherd’s staff." "Fifth, we make a camel because the wise men traveled over many miles of sandy desert on camels that they might find the young child." 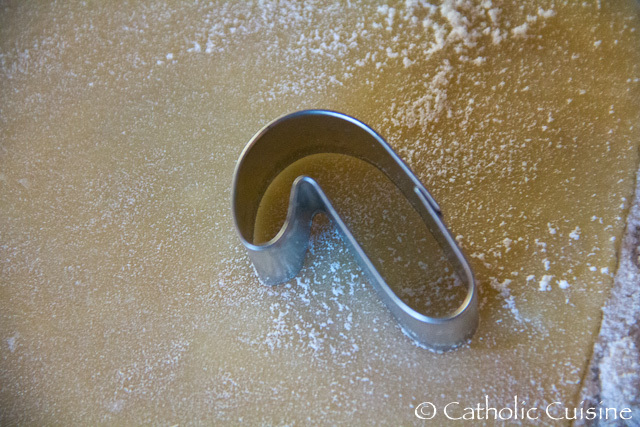 "Then we come to some of the cookie cutters which we can’t find in the Bible, but which have wonderful meaning by which we tell God’s love for us. We make a wreath for it is round and has no end, even as God’s love has no end. He gave to us eternal life which has no end. 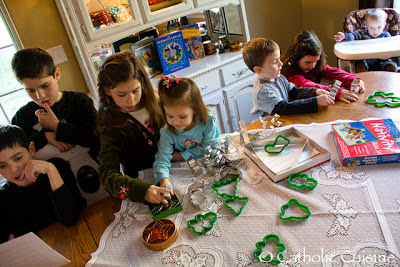 We think of the wreath being made of evergreen and so we frost it green. The evergreen is a symbol of the eternal life which Christ bought for us on Calvary. Then comes the Christmas tree, again an evergreen tree, the symbol of everlasting life. It stays green winter and summer as no other tree. It tells of the love of Christ which goes on and on, and of the eternal life which he gives us if we believe in him as our Savior. And last of all we make the bells, for the bells ring out the glad news that a savior is born this day in the City of David." "And so, as we bake our Christmas cookies, we see the story of the Savior's birth and purpose in our lives. What a wonderful way to gather the little ones around and tell them of God’s love for us. 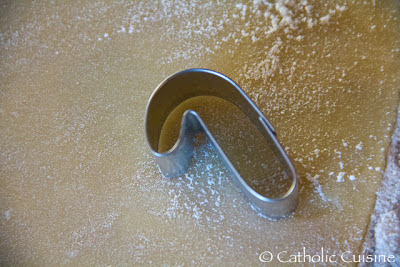 As we roll and cut the dough and mold it into shape, we tell over and over the story that never grows old." "Then breathe a little prayer that we are molding young and pliable lives, minds, and hearts into the right form, that they might come to know and love this Christ that was born on Christmas Day." 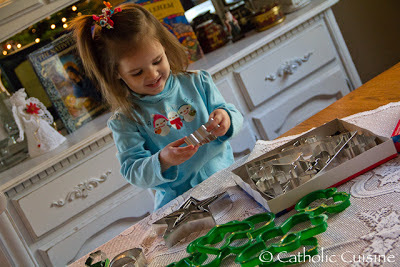 "My prayer is that my children shall never forget the cookie cutters and the story they told of Jesus, His birth and purpose." "Thus we keep Christ in Christmas even with the cookie cutters." Download and print a copy of Cookie Cutters Tell the Story of Christmas here. 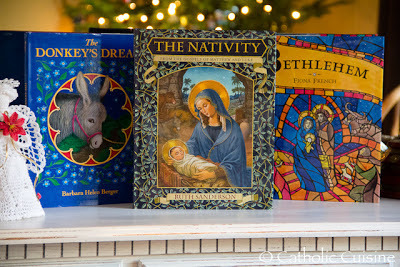 Wishing you all a very Merry 10th Day of Christmas and a Blessed Feast of the Most Holy Name of Jesus! Such cute "models" making Christmas cookies! What a wonderful family activity and tradition to do together. Thanks for providing the download of the story. 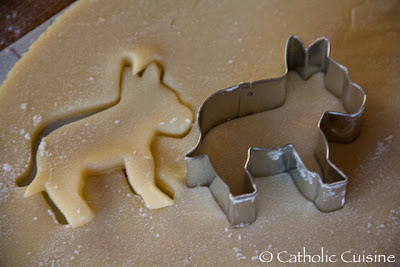 I'll print it out and share with others at the next Christmas cookie exchange in the neighborhood.